While considering one’s death has been central to many spiritual and cultural traditions through the ages, the modern incarnation in our individualistic, me-first society can become something of a vanity project. “Get the funeral you want by planning it yourself” is one guidebook’s promise. (“Put the F-U-N back in funeral!”) It’s an understandable impulse at a time when institutional, commercially-directed funerals have become such a bad brand that many (my father included) don’t want to see a penny wasted on rites or ritual to mark their death. The idea that one’s death is solely “our own” is an assertion unique, I’m pretty sure, to this time and place in the world. How might our deaths be about more than ourselves, tethered to the wheel of life, embedded in community? 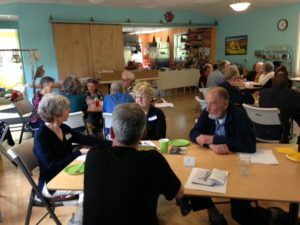 Dying in community was the focus of the inaugural “When I Die Dialogue” hosted at the Columbia Ecovillage cohousing community by my friend and colleague, Don Tarbutton. Attended by members of Don’s residential and extended communities, participants shared stories of the deaths that had been their teachers and considered the question, What does it mean to be a family/ community when death occurs? Using a set of worksheets I’ve developed and a video of how my friend Marcy went out from among us, participants learned about caring for each other after death (minimizing or entirely eliminating reliance on a funeral home) and began to consider their own interest and willingness. Perhaps most impactful was hearing directly from Don, who last year marked his 80th birthday with what’s often called a “living memorial”. Over several months, I had supported Don in considering and documenting his wishes for dying in community, with specific consideration to the community’s role in bathing and dressing his body his body after death, sewing a shroud, holding a three-day vigil with his body in a communal space, transporting his body for burial, and handling the administrative paperwork. Columbia Ecovillage members left motivated to continue the conversation with the rest of their community. Others planned conversations with their family members. Some wondered about forming a club or committee dedicated to building the capacity for community members to care for each other after death outside the framework of personal social capital. Explore the excellent resources on the National Home Funeral Alliance web site and consider attending their Sept 22-24 conference outside Washington, DC. I had the privilege and honor of serving with Don for a number of years when we worked as Chaplains in a local hospice agency. A more caring, gentle and wise friend I could not have found. Thank you for the innumerable contributions you have made to me and to so many others, Don. Your life is a witness to what it means to be truly-human.